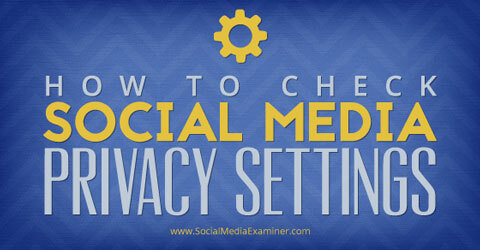 Have you checked the privacy settings for all of your social media platforms? Personal social media management is now more important than ever. As marketers, we’re usually out there promoting our business, yet we still need to be conscious of our privacy. In this article you’ll discover how to adjust the privacy settings on your social media sites, so you share only what you want with the people you want. Why Check Your Privacy Settings? Content uploaded to social media platforms is not always secure, so it’s imperative to understand how to use the privacy features your social media sites have to offer. Remember, each social media platform has its own settings, and some are more complicated than others. We’ll go through privacy settings for Facebook, Instagram, Twitter, Google+, LinkedIn and Pinterest. Facebook is the most popular social media website, topping 1 billion active monthly users. 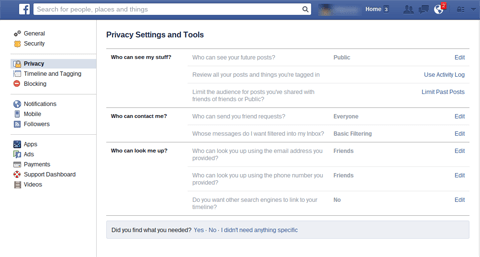 There are three places to set privacy on Facebook: the Privacy tab, and your profile and photo settings. Go to the Privacy Settings and Tools tab by clicking the lock icon on the upper right. First, change the default setting on your posts under “Who can see my stuff?” You can share things with Public (anyone on or off of Facebook) or with Friends. You can also do a custom setting if you want your default to be shared with a previously defined list or if you want to share with everyone except a person or list. Another option is to change your settings for each update before you share it. Justclick the gray button next to the blue Post button to customize. The Privacy tab also has a feature that many people don’t know about: there’s the capability to limit the audience for old posts. For example, let’s say you realized that you were posting publicly the entire time you’ve been on Facebook and you want to beef up your security. Just click the Limit Old Posts button and they will only be available to friends and anyone who has already interacted with the post, including liking, commenting or being tagged in it. Note: You can’t undo this without going to each post individually to change the audience. Make universal changes to your default privacy settings. Decide if you want to make your Facebook posts public, just shared with friends or customized. While those are the major settings in the Privacy tab, there are a few other things you can adjust. Further down on the page, choose who can send you a friend request and whether you want strict message filters in your inbox. Also, determine how others can look you up, including using your personal information to find you. If you want to adjust who can tag you and who can see what content you’re tagged in, go to Timeline and Tagging. Also, the Blocking tab is helpful if you need to block a specific user from seeing your profile. Next, update your privacy settings on your Facebook profile. Click About on your profile to view your basic information. You’ll see several sections, including Work and Education, Places You’ve Lived, Contact and Basic Info and Family and Relationships. Each section has a number of items in it and each item has a privacy setting. Just click on the icon to the left of Edit and to the right of each segment, and decide who can see that information: public, friends, custom or a list. Review all sections of your profile and adjust who (public, friends, custom, list) can view it. Customize each element within your profile, so your privacy is in line with your comfort level. For example, choose whether you want it publicly known that you work for a certain company, whether you want to hide your relationship status from certain groups of your friends or whether you want everyone to have to ask for your phone number. 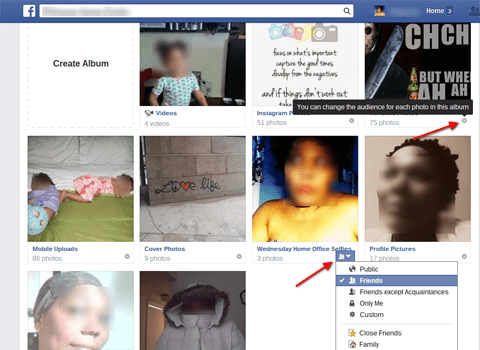 Finally, adjust the privacy for your Facebook photo section. There are two ways to handle the audience setting for your photos: by album and by image. If you upload photos directly into an album, click the audience indicator on the bottom right side of the album to set privacy. For albums with images uploaded individually (like profile and cover photos), you must click each image and enter the privacy setting there. 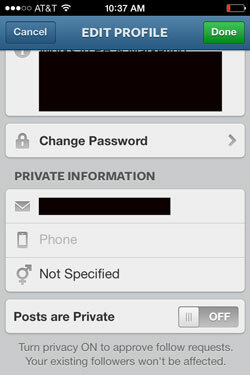 Adjust the privacy by photo or by album. However, for albums to which photos have been added individually, you must change privacy for each image. 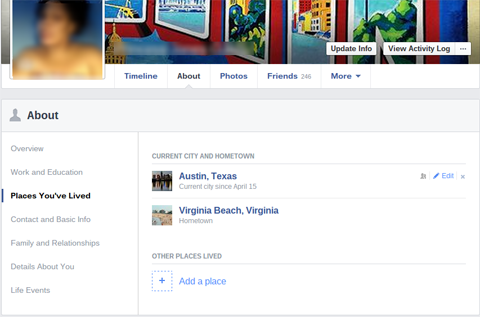 Note: If you set your profile or cover photos as anything other than public, non-friends won’t be able to see them. Therefore, someone who is looking for you won’t have a picture to go on to see if it’s the right “Jennifer Jones,” before friending you. You’ll also appear as the default blank face to others when you’re commenting on a friend’s status. Instagram is almost entirely mobile. The desktop site is stripped down to the very basics and you can’t edit the privacy of your images there. Instead, open your Instagram mobile app and navigate to the profile page by tapping the user icon on the far bottom right of the navigation menu. Tap Edit Your Profile and scroll down. Instagram is primarily mobile, so you must go to the app to change your privacy settings. At the very bottom there’s a switch to toggle private profiles on and off. When set to private, only users you approve can see your photos. Even if you switch to a private profile, your current followers stay the same. To block a particular follower, navigate to that user’s profile, hit the Settings button on the top right corner of the page and then tap Block User. Like Instagram, Twitter’s privacy settings are pretty simple. Either you have a private account or you don’t. To change the privacy settings on your account, open the Settings menu. Click Security and Privacy in the menu on the left side of the screen. Select Protect my Tweets if you want to approve each follower instead of allowing anyone with Internet access to read your tweets. 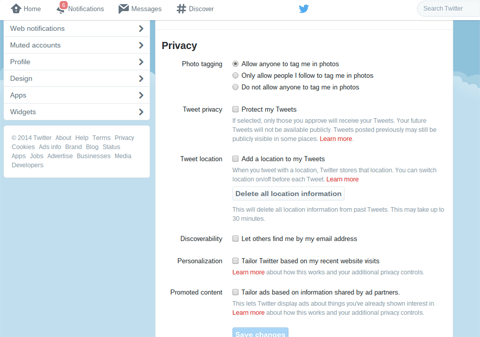 If you want to be completely private on Twitter, click Protect my Tweets and then approve any follower requests. Unlike Instagram, Twitter also gives the option to allow followers to see your location for each tweet. Also decide whether users with your email address can find your Twitter profile. After you’ve made changes, click the Save Changes button at the bottom.